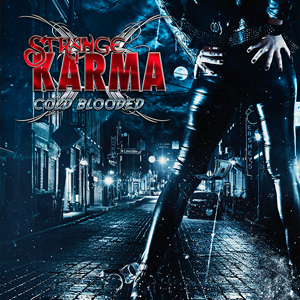 Sydney, Australia’s STRANGE KARMA is a compelling melodic hard rock trio that consists of Martin Strange (vocals, piano, guitar), Paul Strange (guitar) and Jason McDonald (drums). Their sound includes a wide diversity of influences; fans will hear references to LED ZEPPELIN, QUEEN and STYX. To these ears, there seems to be a little influence by THE CULT and THE WHO as well. Cold Blooded is STRANGE KARMA’s sophomore album. Side one kicks off with the acoustic-tinged “Freedom”. The song conveys some angst among the frantic guitar leads and backing vocals. “Devil From The Moon” falls more into the hard rock category, and features some nice power chords. The song was the first single to be released, and a video can be viewed on KNAC.COM right HERE. “Crying For Your Love” features a piano and vocal intro from Martin, and could be described as a power ballad. The tasteful solo by Paul adds to the song. “Realize” is one of the harder rocking tracks on the album. “I Believe (London Town)” is a sparse, yet inviting composition highlighting Strange’s piano and sentimental vocals. Side two begins with “Heartbeat”, a mid-tempo rocker with an acoustic guitar running throughout the song. “Should Have Seen It Coming” is a full-on rocker with a sweet groove during the solo. The title track “Cold Blooded” features some of Martin’s more interesting vocals, touching on some falsetto moments here and there. I also think the song features one of Paul’s best solos on the album. Jason provides a massive groove near the end of the track. The classic rock flavored “Hey Man” follows. This song has commercial appeal and would probably be a good single release. The final track, “Dreams”, is an epic composition and the longest song on the album. The band showcases a myriad of influences and styles on this song. It is probably my favorite song on Cold Blooded. Ultimately, Cold Blooded is defined by Martin Strange’s infectious, passionate vocals. Stylistically, he has a lot in common with Lenny Wolf (KINGDOM COME) and Justin Hawkins (THE DARKNESS). But the comparisons end there, because STRANGE KARMA is no copycat band; their sound is unique and all their own. I have never heard a band that sounds like this. Martin Strange described the band’s sound on this album as “showcasing the versatility of the music we like to create and play”. You might be tempted to ask for more straight-ahead rocking songs from STRANGE KARMA; but that would rob you of their nervous energy, which is what gives them a ton of appeal. The band decided to release the new album physically in vinyl format only, a bold move for today’s music scene. Cold Blooded was produced, recorded, mixed, and mastered by Grammy-nominated and multi-platinum engineer and producer David Ivory (SILVERTIDE, HALESTORM, THE ROOTS) and co-produced by Joe Lam. Honestly, this album sounds fantastic. The stylish yet retro album cover by Ciao Caldas adds to the overall quality. The album contains 10 songs at around 42 minutes.